Dr. Rajkumar Kore is currently working as a postdoctoral researcher with Dr. Mark Shiflett’s research group since May 2018. His current research interests are development of ionic liquids (IL) and zeolite for catalysis, separation, etc. Prior to joining Dr. Shiflett’s group, Dr. Kore worked as a postdoctoral research scientist with Prof. Robin D. Rogers’ group at The University of Alabama from November 2014 to April 2018. There he worked on multiple IL-based projects, led a team of research postdocs on an industrially sponsored project (from Reliance Industries) and developed several homogeneous, as well as, heterogeneous ILs used for catalysis and separation processes. Dr. Kore completed his Ph.D. degree in chemistry from Indian Institute of Technology (IIT) Ropar with Prof. Rajendra Srivastava, from 2010 to 2014. His doctoral study was primarily focused on the development of ILs, as well as, porous materials like hierarchical zeolites for catalysis. Prior to his Ph.D., he worked as a research assistant on development of a continuous process for biodiesel in the Indo-US project with Dr. D. Srinivas in National Chemical Laboratory Pune from 2009 to 2010. He has 23 research articles (with 540 citations), 4 US patents, and few more works under review. Ana Morais received her Ph.D. in Sustainable Chemistry in 2018 from the NOVA University of Lisbon, Portugal. Her doctoral research was focused on the development of effective and more sustainable high-pressure technologies for valorization of biomass residues into biofuels and chemicals. While pursuing her Ph.D., Ana Morais has received the Green Talents Award (2016) – International Forum for High Potentials in Sustainable Development – from Federal Ministry of Education and Research of Germany for her work in the field of sustainable development. Currently, Ana is doing her post-doctoral research at The University of Kansas, in Dr. Mark B. Shiflett’s laboratory, where she is working on the determination of physical properties of refrigerants in lubricants and polymers, in collaboration with Chemours Company. Ana is also working on the development of an effective encapsulation method to prevent the denaturation of proteins in vaccines during transportation. In the future, Ana looks forward to pursuing a career in industrial research. Sachin U. Nandanwar received his PhD degree in Chemical Engineering from the Sardar Vallabhbhai National Institute of Technology, Surat (India) in 2013. His research focus was synthesis and characterization of the γ-Al2O3 supported ruthenium catalyst for the hydrogenation of benzene. He holds a bachelor degree, as well as master degrees, in Chemical Engineering from the University Institute of Chemical Technology, UICT (formerly UDCT), North Maharashtra University and Dr Babasaheb Ambedkar Technological University, (India) respectively. Prior to joining the University of Kansas, Nandanwar worked as a Post-Doctoral Research Associate at the University of Idaho, Moscow, Idaho from May 2014 to December 2016. He worked on the design and development of the nanostructured sorbent for selective removal of iodine and krypton from the off-gas stream. After that, Nandanwar joined another Post-Doctoral Research Associate at the University of Wyoming, Laramie, Wyoming. He worked on the development of the mixed oxide-supported metal catalysts (bifunctional material/heterogeneous catalysis) for dry reforming of methane to syngas production from January 2017 to May 2018. Nandanwar was responsible for the design, development and characterization of nanomaterials, porous materials, and heterogeneous catalysis and their use in the field of sustainable energy and environmental applications. Currently, he is working as a Post-Doctoral Research Associate in the Professor Mark B. Shiflett research group. His present research involves the separation of gases using porous material. Tugba received her Bachelor’s degree in Chemical Engineering at Ankara University in Turkey and her master’s degree in Chemical Engineering at the University of Oklahoma. She has been a PhD student at KU since Spring 2014. During the first three years of her degree, she worked on low salinity waterflooding on carbonate reservoirs. She is currently working on ammonia absorption in ionic liquids. Her current research interests are ionic liquids, heating cooling cycles, vapor liquid equilibria, zeolites, nanofluids, surfactants and surface phenomena. As she is very enthusiastic about research, she hopes to pursue a career in research, be it in industry or academia. She also enjoy teaching and spreading scientific knowledge. Nicholas Reding received his Bachelor of Science in chemical engineering from the University of Kansas in 2016. Following graduation with his undergraduate degree, Nicholas currently works in the field of explosion protection, designing protection solutions for a wide range of applications. After a year of industry experience, he decided to return to KU to pursue a master’s degree in chemical engineering. His research interests include process safety, combustion science, and explosion protection (more specifically, suppression and isolation of non-standard deflagrations). Under the guidance of Dr. Shiflett, Nicholas is currently working on a study that illustrates the effectiveness of various inhibitors for the suppression of highly reactive metal dust deflagrations. Working in collaboration with Fike Corporation, his primary focus is to characterize the ability of various agents to absorb heat and limit the maximum pressure rise during contained combustion. Upon graduation, Nicholas plans to explore additional research studies with continued attention towards industry-related projects. Ankit received his bachelor’s degree in Chemical Engineering from Indian Institute of Technology Madras, India in 2016. He was admitted for his PhD at KU in fall 2016 as a Chancellor’s Fellow. During the first two years of PhD he has worked on development of carbon nanotubes based high surface area materials. Under the guidance of Dr. Shiflett, Ankit is currently working on metal separations from mixed metal oxides. Upon graduation, he plans to pursue a career in industrial research. Alejadra was Dr. Shiflett’s first graduate student at KU. She graduated with her M.S. in Chemical Engineering with Honors in December of 2018. She now works for Black & Veatch in Kansas City, KS. Alejandra received her chemical engineering bachelor’s degree with honors from the University of Kansas in 2014. After graduating, she worked in the process engineering industry running dynamic state simulations. Dr. Corbin is an adjunct senior research scientist with 32 years of industrial research experience. He has issued 62 US patents and has published more than 130 publications, in addition to co-editing two books on porous materials. His research interests include applications of inorganic materials to industrial problems, zeolites, separations, and metal oxides. Dr. Harmer is currently working at Sustainable Chemistry Consulting in Landenberg, PA. He has 32 years of industrial experience with several commercial products, 73 patents, and 81 publications. He is also a member of the board J. Green Chemistry, and is a NSF and DOE grant reviewer and Strategy Consultant. He is primarily interested in acid catalysis, ionic liquid applications, and biobased adhesives. Dr. Leffew is an adjunct professor at Villanova University. He retired from DuPont in 2016, where he held the highest technical position in the company, DuPont Fellow. In his 41 year career there, he was involved in the discovery, development and commercialization of numerous polymer processes and products, including Neoprene, PET for bottle resin, PMMA, Ethylene copolymers, polymers for optical disks, color copier toner, OLED devices, flexible solar cells and methanol fuel cells. He received DuPont’s Engineering Excellence Award four times and is inventor on 29 US Patents and has over 60 publications and presentations. His interests include polymerization reactor design, polymer process synthesis and processing, advanced process control and product design. Dr. Jackson is an adjunct senior research scientist at KU and an adjunct professor at Villanova University. Previously, he was a DuPont Senior Technical Fellow with 33 years of industrial research experience. In addition to his 41 US patents and 28 publications and presentations, he is also a recipient of the Engineering Excellence Award for the development of Extractive Distillation technology. His primary area of research interest includes fluid phase thermodynamics of biphasic systems and scale ups of liquid-liquid extraction systems. Michael is a junior studying chemical engineering and economics. In Dr. Shiflett’s lab, he works with Alejandra Rocha studying desalination using clathrate hydrates and also assists Dr. Shiflett in creating ASPEN Plus guides. In his free time, Michael serves as an Engineering Senator for Student Senate, a Music Mentors Coordinator for the Center for Community Outreach, and a member of the Student Senate Finance Committee. Austin is a senior studying Chemical Engineering and Mathematics at KU. He is currently investigating electric field assisted CO2 desorption from ionic liquids with Dr. Gilbert. In his free time, Austin is a musician and avid sports fan—playing trumpet in the Marching Jayhawks as well as the KU Volleyball band for 2 seasons. Kaylee is a junior pursuing a degree in chemical engineering at KU. In Dr. Shiflett’s lab, she is studying the thermal stability of vaccines and how to use encapsulation to prevent denaturation of the proteins in vaccines during transport. At KU, she is involved in SWE, AIChE, and is one of the large event chairs for Chem Club. In her free time, she enjoys going on a run and teaching chemistry to children at Chem Club demonstrations. Channary is a junior pursuing a degree in chemical engineering with an emphasis in biomedical engineering at KU. She is currently working on the Vaccine Encapsulation Project. The goal of the project is to encapsulate proteins in mesoporous materials to prevent denaturing during transportation. Grant is currently a junior studying chemical engineering at KU. He is part of the valuable metal recovery group targeting the recycle of lithium and cobalt from mixed metal oxide batteries. In his free time, he plays water polo on the KU club team and is a member of Sigma Pi. Elizabeth is a senior pursuing a degree in Chemical Engineering. She worked on the creation and development of the Shiflett Research website and assisted Alejandra Rocha with a techno-economic evaluation of a process of desalination using clathrate hydrates. She is now working on a project with Sowmya Ragothaman to investigate the removal of sulfites, a chemical preservative, from wine. In her free time, she is also the president of Sigma Delta Tau, a Panhellenic sorority, and a member of Theta Tau, a professional engineering fraternity. Kerry is a senior pursuing a chemical engineering degree with a biomedical emphasis. In Shiflett Research Group, she is a member of the iron binding zeolite project team alongside Dr. David Corbin and Professor Cory Berkland. She is studying different zeolite structures and their affinity to bind iron. Outside of classes, Kerry immerses herself in her role of KU Chem Club Secretary; performing chemistry demos for children and coming up with chemistry jokes to share with her peers. David is a senior at KU pursuing a degree in Chemical Engineering. They will be working with Nicholas Reding on characterizing suppressant agents for metal dust explosions. In their free time, David serves as President of Engineers Without Borders KU, Vice President of the Society of Hispanic Professional Engineers, and an active Fellow of the Self Engineering Leadership Program and Vann Fellowship of Economic Innovation. Anna is currently a sophomore studying chemical engineering with a biomedical focus. She is researching the iron binding properties of zeolites as well as other structures with Professor Mark Shiflett, Dr. David Corbin, Professor Cory Berkland and Kerry Kao. Anna was born in Tulsa, Oklahoma and moved to Wichita, Kansas 4 years ago. In her free time, Anna is involved in AICHE and SWE on campus and is passionate about ceramics. She is also a fellow of the Self Engineering Leadership Program and Vann Fellowship of Economic Innovation. Sowmya is currently a junior pursuing a degree in Mechanical Engineering. In Dr. Shiflett’s lab, she works with Elizabeth on the removal of sulfites from wine. Using CAD modeling and 3D printing, she is developing a prototype device which will filter the wine. Outside of class, she is president of the KU Women’s Ultimate Frisbee team and secretary of TEDxKU, and she also enjoys singing and playing chess. Elvis is currently a sophomore studying chemical engineering at the University of Kansas. In Dr. Shiflett’s lab, he is researching the stabilization of vaccines via encapsulation alongside Dr. Picking, Kaylee Barr, and Channary Ny. Outside of the lab, Elvis is involved with AIChE, Honors StuCo, and Shot@Life. In his free time, Elvis enjoys playing guitar and playing tennis. Jane is a junior pursuing a degree in chemical engineering with a concentration in pre-medicine. She is currently working on researching the iron binding capabilities of zeolites with Professor Mark Shiflett, Dr. David Corbin, and Professor Cory Berkland. Outside of classes, Jane is active on the board of International Student Association, is an orientation leader for International Orientation, and is a member of the University Honors Program. In her free time, Jane enjoys knitting, swimming, and running with her dog. Lily is a sophomore studying pharmaceutical sciences and religious studies at KU. She is researching vaccine protein encapsulation for the prevention of denaturing in Dr. Shiflett’s lab. Besides being in the lab, Lily is involved with Navigators and CCO and is part of the University Honors Program. Mekayla is a sophomore pursuing a degree in Chemical Engineering. She is currently working on the Sulfite project with Elizabeth Hyde and Sowmya Ragothaman. The project focuses on finding compounds that aid the removal of the chemical preservative sulfite from wine. Outside of class she is involved in the Society of Women Engineers, iHAWKE, and oSTEM. Kalena is currently a sophomore studying chemical engineering at the University of Kansas. She is researching the stabilization of vaccines via encapsulation alongside Dr. Picking, Kaylee Barr, Elvis Umana, Lily Higgins, and Channary Ny. She is part of the University Honors Program and is highly involved in the Scholarship Hall Community, where she is the Community Service Chair at Watkins Scholarship Hall. Kalena regularly volunteers at the Lawrence Humane Society as well. During her free time, she likes to read books, hang out with friends, build robots with her dad, and bake. Edward is currently a sophomore studying chemical engineering . In Dr. Shiflett’s lab, he is assisting Nicholas Reding in his research on suppressing metal dust explosions. Edward is a Lawrence native . In his free time, Edward is involved in AICHE and the KU Chemistry Club on campus. Among Edward’s many interests include cooking, baking, puzzles, traveling, manatees, spending time with his pet rabbit, and going on late night adventures around town that often involve swing sets and impromptu karaoke. He is also a fellow of the Self Engineering Leadership Program. Lansten is a sophomore pursuing a degree in chemical engineering at KU. In Dr. Shiflett’s lab, he is researching ways that fluorinated organic compounds PFOA and PFOS can be removed from water alongside Dr. Morais, Alejandra Rocha, and Channary Ny. Outside of classes, Lansten is involved with AIChE and is part of the University Honors Program. In his free time, Lansten enjoys playing basketball and soccer. Noses Lor is a junior pursuing a degree in chemical engineering with a biomedical emphasis at the University of Kansas. He is part of the team researching ways to remove PFOA and PFOS using activated charcoal and zeolites. Erin is currently a freshman studying chemical engineering at KU. In her free time, Erin serves as the Vice President of Campus Relations of Engineering Student Council and as a varsity member of the KU Crew Rowing Team. She is also a part of the University Honors Program and the KUEST ONE Scholars Program. Emily Bruggeman is a sophomore studying elementary education at KU. She has been working with Michael Shao as the voice actor for the Aspen Plus video modules. On campus, Emily has served as the co-coordinator for the Center for Community Outreach’s Music Mentors program, and she currently serves as the Managing Director. She has also enjoyed being a Resident Assistant at Naismith Hall, as well as participating in an Alternative Break, choir, and other KU and Lawrence activities. As of 2018, Evan is a high school senior in Libertyville, IL. In his free time, he enjoys playing euphonium and League of Legends. He became interested in chemistry during his junior year when taking an AP chemistry course and loved the class and said he found chemistry to be fascinating and practical at the same time. This summer he is working mainly in Dr. Shiflett’s lab with an undergraduate research team who helped mentor him in lab safety and basic experimental protocol. He helped improve reproducibility and reliability of lab results. Patrick Cannon graduated from Johnson & Wales in Providence, Rhode Island in 2013 with a B.A. in Culinary Arts and Food Service Management. Previously, he worked for Hyatt Hotels in both San Antonio and Denver as a Sous Chef. Patrick joined the Teach for America Corps in 2016 and has been placed in Oklahoma City working at Oklahoma Centennial Mid-High School where he teaches 7th and 8th Grade Science, Anatomy, and Mathematics. Patrick has joined the Shiflett Lab through the CEBC’s Research Experience for Teacher program. Patrick’s main areas of interest are zeolites and their potential uses as well as how the methodology of research in the Shiflett Lab can be translated into lesson for the 7th-12th Grade Science classroom. Shelly is a participant in the Research Experiences for Teachers (RET) program whose goal is to expose and engage high school science teachers to the exciting research being done at the University of Kansas and take this back to their classroom. Shelly earned her BS in Biology from Southwestern College in Winfield, Kansas and a masters in Curriculum and Instruction from Saint Mary University in Leavenworth, Kansas. Shelly has 28 years of experience in the field of education with 25 of that in her current position with Santa Fe Trail High school where she teaches Biology, Earth & and Space Science and Energy Science. In her first year in the RET program Shelly worked under Dr. Susan Williams and researched the runoff potential of Hydroxyapatite which is a byproduct of the algal hydrothermal liquefaction process used to produce renewable biodiesel. As a second year RET participant Shelly is excited to work with Dr. Shiflett’s staff and to learn how sulfite and iron absorption can be implemented in her high school classroom. Rachel is studying Mechanical Engineering at the University of Kansas. In Dr. Shiflett’s lab, she assisted Nicholas Reding in his research on suppressing metal dust explosions. William (Bill) Gilbert received his Ph.D. from the University of Kansas, Department of Chemical and Petroleum Engineering in 2016. While pursuing a Ph.D., Bill received the Madison and Lila Self Graduate Fellowship and was a School of Engineering Graduate Ambassador. His graduate research focused on the development of a novel enzymatic method for degrading polyacrylamide polymer used in slickwater fracturing. Bill received a B.S. in environmental science from Haskell Indian Nations University and was named the American Indian Higher Education Consortium Student of the Year and the Midwestern Collegiate Athletic Conference Scholar Athlete of the Year. His collegiate work was interrupted in from 2003-2005 when he was deployed to Tikrit, Iraq, through the U.S. Army Reserve. Bill also participated in the Haskell/KU Bridge program and Post-Baccalaureate Research Education Program where he conducted cardiopulmonary physiology and polymer thermodynamics research. Bill joined Dr. Shiflett’s lab as a post-doctoral research assistant during the Fall of 2016 and supervised a number of undergraduate projects in addition to a confidential industrial project. On the summer of 2018, Bill initiated his career in industry with Chemours Chemical Company at the Chemours TiO2 facility in New Johnsonville, Tennessee. Dave Minnick conducted his graduate work at the University of Kansas in the department of chemical and petroleum engineering from 2011-2016 as a Madison and Lila Self Graduate Fellow. The core of Minnick’s doctoral research was dedicated to leveraging ionic liquid solvent technology for the development of improved cellulosic biomass processing routes. After completing his Ph.D. with honors in 2016, Minnick was hired as a short-term post-doctoral research associate to investigate a proprietary chemical reaction for the Chevron Phillips Chemical Company as part of a joint project between the Center for Environmentally Beneficial Catalysis and Chevron Phillips. Within Dr. Shiflett’s lab, Minnick continued his industrial-academic collaborative research efforts as a post-doctoral research associate overseeing multiple undergraduate projects and a confidential industrial project. Since then, Minnick has moved on to a principal research scientist position with Battelle in Aberdeen, Maryland. Zakk Roy graduated with a B.S. degree in chemical engineering at the University of Kansas on May 2018. He worked with Dr. Mark Shiflett, Dr. David Corbin, and Dr. David Minnick on a project to recycle cathode materials from spent lithium-ion batteries. Zakk is now working with Honeywell in Kansas City, Missouri. Sofia graduated with a B.S. degree in chemical engineering with a concentration in pre-medicine at KU on May 2018. She worked on a zeolite project with Professor Mark Shiflett, Dr. Bill Gilbert, Dr. David Corbin and Professor Cory Berkland. Sofia studied several zeolite structures and their ability to bind iron. The end goal of the project was to develop a drug to treat hemochromatosis. Grant graduated with a B.S. degree in chemical engineering at KU on May 2018. During his time in the Shiflett lab, he researched the iron binding capabilities of zeolites and several other structures. He researched this project with Professor Mark Shiflett, Dr. Bill Gilbert, Dr. David Corbin, Professor Cory Berkland, Katie Bauguess, and Sofia de la O.
Katie graduated with a B.S. degree in chemical engineering at KU on May 2018. In our lab, she worked on a zeolite project with Professor Mark Shiflett, Dr. Bill Gilbert, Dr. David Corbin and Professor Cory Berkland. She researched several zeolite structures and their ability to bind with metals with a specific focus on iron. Katie is now working with ExxonMobil in Baton Rouge, Louisiana. Brooks graduated with a B.S. degree in chemical engineering at KU on May 2018. In the Shiflett research group he assisted Dr. David Minnick with a project investigating gas sorption in ionic liquids. Brooks will be working with Burns & McDonnell in Houston, TX beginning this summer 2018. Maddie graduated on May 2018 with a B.S. degree in chemical engineering with a focus in biomedical engineering. In the lab, she is researched the removal of sulfites from wine. Sally Ritchie graduated with a B.S. degree in chemical engineering here at KU on May 2018. In Dr. Shiflett’s lab, she worked on researching the solubility of ammonia in ionic liquids with Tugba Turnaoglu, which has applications in absorption refrigeration cycles, as well as liquid-liquid equilibrium of alcohols and ionic liquids. Simon graduated with a B.S. degree in chemical engineering at KU in Summer of 2017. During the summer he worked with the vaccine project team in Dr. Shiflett’s research group. Simon returned to KU for his Ph.D program in Chemical and Petroleum Engineering and is currently working in Dr. Alan Allgeier’s lab. Yadira graduated with a B.S. in Petroleum Engineering with a Geology minor on May 2017. She contributed to the Shiflett lab by setting up and calibrating gas chromatographs with flame ionization (FID) and thermal conductivity (TCD) detectors. Additionally, Yadira created a design concept with KU logos and inspiring quotes to foster a culture of creativity and energy within the lab. Dylan is currently pursuing a degree in chemical engineering at KU. He worked with Professor Mark Shiflett, Dr. Bill Gilbert, and Dr. David Corbin on a project that aims to investigate the ability of several hydrotalcites at removing sulfites from wine. David is currently a senior studying chemical engineering at KU. He was part of the sulfite removal group alongside Dylan Flohrshutz, Professor Mark Shiflett, Dr. Bill Gilbert, and Dr. David Corbin. The group manipulated different techniques to measure sulfites in wine, along with discovering optimal materials to remove these sulfites. Congratulations to our recently published researchers! Congratulations to Tugba Turnaoglu, Nick Reding, Alejandra Rocha, and Raj Kore for their recent publications! In just a short 3 months, Shiflett Research Group has featured their research in five publications in various journals. Read more about their work in their respective research fields at the links below. Congratulations to our researchers for recognition of their hard work! A $1 million gift from University of Kansas alumni Richard and Elizabeth Hoover of Northport, Michigan, will establish a chemical engineering research lab at KU’s School of Engineering. Mark Shiflett, Foundation Distinguished Professor in the Department of Chemical & Petroleum Engineering at KU, said being able to build laboratories such as the one supported by the Hoovers resonates with businesses that visit KU. This story has been featured in both KU News and the Lawrence Journal World. Read the full story by Michelle Tevis in the KU News here. Congratulations to Dr. Shiflett for being featured as the alumni spotlight for the College of Engineering at the University of Delaware. Dr. Shiflett began his work with UD in 2011 as an adjunct professor in chemical engineering before coming to KU in 2016. See the full story here. Dr. Shiflett was recently elected as a Fellow of the National Academy of Inventors! Join us in congratulating him for such a great honor. Read the full story here. We would like to extend our warmest congratulations to Alejandra Rocha for successfully defending her Master’s thesis. Her presentation on December 10th was entitled “Phase Equilibria of Imidazolium-Based Ionic Liquids and Water.” We are so proud of all her hard work throughout her time working with the Shiflett Research Group! The KU reception was a hit! Thanks to all of you who could attend, can’t wait to see you again next year! Be sure to find more pictures of us in the Gallery page of our website! The Shiflett team is excited to be attending the 2018 AIChE conference next week (see our talks below)! KU will also be hosting a reception Sunday Oct 28th at the Westin Convention Center – Westmoreland Central Room from 7:30 pm to 9:30 pm. Don’t forget to stop by! Dr. Shiflett will be giving a plenary lecture at EuCheMSIL in October at Lisbon, Portugal. If you will be attending, be sure to stop by and say hi! More info here. The Shiflett group shared a great time together supporting the local soccer team Sporting KC against Orlando City. And yes … of course SKC won!! Be on the lookout for papers from our group in press soon! Nick Reding and Dr. Shiflett ‘s paper: Metal Dust Explosion Hazards: A Technical Review was accepted into the Industrial & Engineering Chemistry Research Journal. Dr. Minnick, Alejandra Rocha, Tugba Turnaoglu, and Dr. Shiflett ‘s paper: Gas and Vapor Sorption Measurements using Electronic Beam Balances was accepted as a featured article in the Journal of Vacuum Science & Technology A. The KU-rooted pharmaceutical company Savara went public on NASDAQ May of 2017, and last month had the great opportunity to ring the market bell in NYC on July 23rd. Our own research associate, Dr. Cory Berkland (profile), was actually part of the creation of Savara, which he started out of his lab in 2007 to develop aerosolized drug therapies. Read more here! Congrats to Ana and the Vaccine Team! Ana C Morais was recently awarded the 2018 Baxter Young Investigator award for her work on the vaccine project. Rock Chalk! Follow this link for more info on the advancements the Shiflett group is making on the thermal stabilization of vaccines. For many of our undergrads summer and research go hand in hand, and several of them had the opportunity to present their work at the KU 2018 Summer Poster session. See their pictures below 🙂 ! This summer, Simon Velasquez, one of Dr. Allgeier grad students, set up an instructive hands-on activity for our high school intern: fire extinguisher safety! Thanks Simon! The Shiflett Research group and Allgeier Research group enjoyed a fun summer cookout at Clinton Lake and showed off their impressive sand volleyball skills! More pictures in our Gallery page! Dr. Mark Shiflett is working to elevate the research and educational opportunities of KU’s new Central Utility Plant (CUP), which produces hot and chilled water for KU’s Central District, while reducing KU’s carbon footprint and creating stronger ties with industry. Read more here! Tugba, Alejandra, and Dr. Shiflett gave great talks and poster presentations at the 20th Symposium of Thermophysical Properties at the University of Colorado Boulder! See the list below! Welcome to Our 3 New Post Doctoral Researchers! Dr. Ana Morais, Dr. Rajkumar Kore, and Dr. Sachin Nandanwar have joined the group beginning this summer. We give them a warm welcome and look forward to celebrating their future accomplishments with the team! Learn more about our new members here. Congrats to the Happy Couples! May has been full of big dates with several of our undergrads graduating, Bill and Dave saying bye to the team, welcoming new post-docs, and people getting married! Bill and Tara celebrated their marriage on Saturday May 12th in Lawrence, KS and we wish them the best on this wonderful journey together! Alejandra and Jason also tied the knot in Lawrence on Friday May 18th; we wish them a lifetime of love and happiness! Dr. Dave Minnick and Dr. Bill Gilbert will be departing the lab group and starting their new jobs in industry within the coming weeks. We will miss them greatly, but we wish them the best on their new careers! Our sponsor network continues to expand, and we are honored to have their support! Our list can be found on our Sponsors tab. Feel free to check them out! Congratulations to Tugba on her Award! Tugba Turnaoglu, along other KU CPE researchers, attended the 2018 Capitol Graduate Research Summit which was held at the State Capitol, Topeka, on the 27th of March, 2018. She received the BioKansas Presentation Award at the Summit. Yay, Tugba!! For more info please see here. Great news keep coming for our team! Tugba Turnaoglu passed her comprehensive exam today! Her topic was “Protic Ionic Liquid-Zeolite Composites for Ammonia Separation in the Haber-Bosch Process.” Congratulations, Tugba!! Katie Bauguess has accepted a full time position with ExxonMobil. She will be working as a contact engineering in their Baton Rouge, LA site beginning August, 2018. Dr. David Minnick recently accepted a principal research scientist position with Battelle. Dave will begin working at the Battelle Eastern Science and Technology Center located in Aberdeen, MD starting in June, 2018. Congratulations to Dr. Bill Gilbert who accepted an offer of employment from the Chemours Chemical Company. Bill will be working at the Chemours TiO2 facility in New Johnsonville, Tennessee. He will start in June 2018. Shiflett lab is on the news again! Check out the KU article featuring undergraduate Maddie Lyda, Dr. Bill Gilbert, and Dr. Mark Shiflett on researching sulfite removal from wine. Our group hopes to develop and market an inexpensive device which can remove 99% of sulfites from wine. Maddie Lyda samples wine using a total sulfur analyzer. Photo courtesy of KU. Dr. Mark Shiflett recently completed a news story on ionic liquid solubilities with AZO Network, a system focused on “Telling science, technology and medical stories to people who can make a difference.” In the piece, Dr. Shiflett discusses the different applications of ionic liquids and describes the importance in measuring gas solubilities. Our group is very grateful to have presented at the 2017 AIChE Annual Conference. We had over 8 talks and posters representing the Shiflett group. Congrats to Brooks Danahy for earning an award on his poster at the undergraduate session! And, the AIChE hospitality suite was a success! We look forward to seeing you again next year! Will you be at the annual AIChE conference in Minneapolis this year? Join us at our hospitality suite and learn about our novel research and cutting-edge facilities! 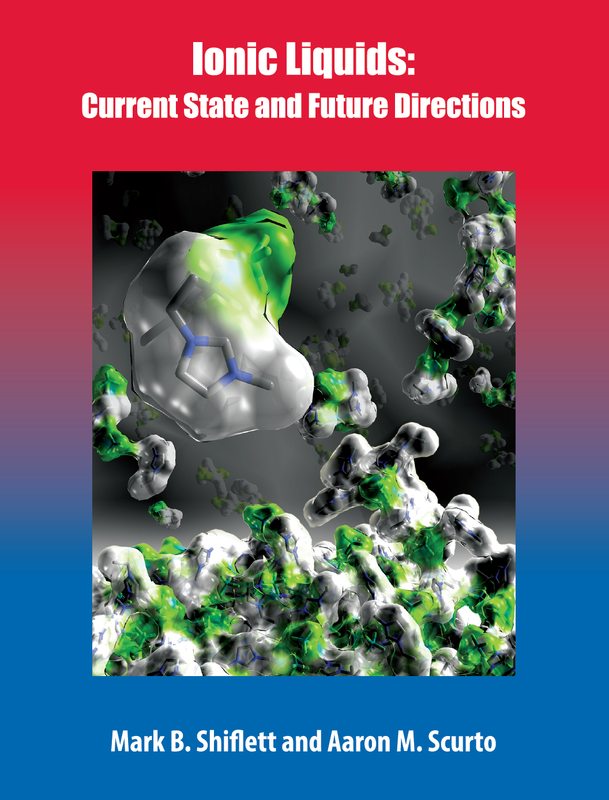 The book Ionic liquids: Current State and Future Directions edited by Dr. Scurto and Dr. Shiflett, was published recently. And of course, the book (bottom left image) displayed their KU pride with crimson and blue on the cover! 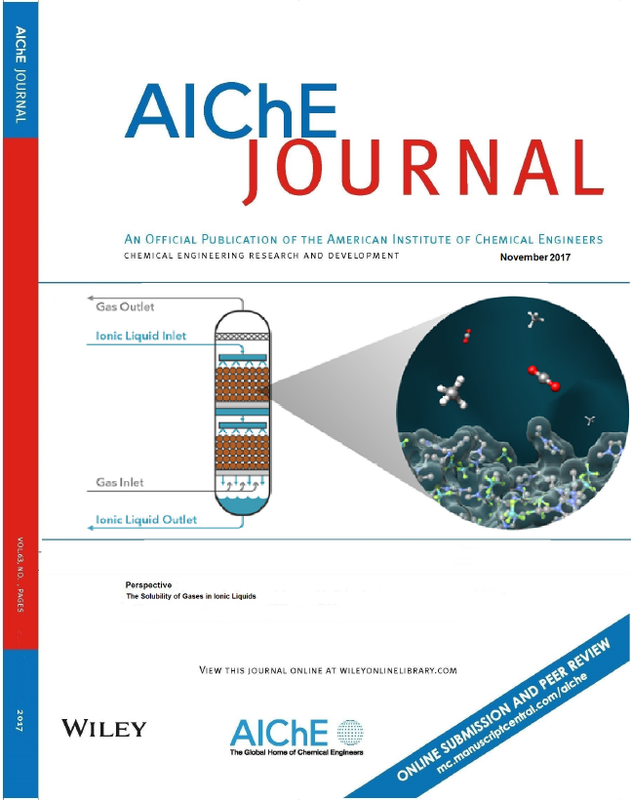 In addition, Dr. Shiflett wrote a perspective article in the November issue of the AIChE Journal, and it is featured on the cover (bottom right image). Dr. Mark Shiflett was invited to present a keynote lecture at the European Conference on Thermophysical Properties in Graz, Austria. He recently traveled to Graz, and presented his a talk “Ionic Liquids – Phase Behavior to Applications” on the morning of Tuesday September 5th. Later that week, Dr. Shiflett also had the opportunity to visit the Hiden Isochema Ltd. headquarters in Warrington, UK to celebrate 15 years of successful collaboration. Dr. Mark Roper, Director of Sales and Marketing at Hiden, met with Dr. Shiflett and provided a tour of Hiden’s advanced instrumentation. Dr. Roper and Dr. Shiflett touring the headquarters of Hiden Isochema, Ltd.
We are excited to have our graduate students and postdoctoral researchers presenting at two upcoming conferences. Tugba, Alejandra, Bill, and Dave will be presenting posters at the upcoming 2017 ACS Midwest Regional Meeting – Catalysis Symposium at KU on October 19th, and oral presentations at the 2017 AIChE Annual Meeting in Minneapolis on October 29th – November 2nd. Be sure to stop by if you are attending the conferences! Shiflett lab group hosted an open lab afternoon on April 28. The event featured undergraduate research presentations on their different projects from this semester. Dr. Shiflett and our post doctorate researchers also gave visitors tours of the lab space. A new kinetics experiment was completed and added to the undergraduate chemical engineering teaching laboratory for the Chemical Engineering Laboratory I, C&PE 616. Students can measure the kinetic orders and activation energy for the iodination of acetone reaction (CH3COCH3 + I2 → CH3COCH2I + HI) using HCl as a catalyst. The reaction is a color change reaction so it starts as a colored solution when iodine is added (I2 is red/brown in color) and goes clear as the product iodoacetone is formed (iodoacetone is clear). The experimental setup consists of a 1 liter stirred tank reactor with a cooling/heating jacket controlled with a Peltier temperature bath. A pump circulates a sample of the reactor fluid through a flow cell in a spectrometer for instantaneous analysis of the iodine concentration as a function of time. The temperature and absorbance are recorded using a LabView® data acquisition program on a laptop computer. The waste can be drained to waste containers beneath the reactor and the system is mounted on a moveable rack which allows the experiment to be portable. The setup is identical on both sides of the rack so that students can work in groups of two to run both reactors simultaneously. The spectrometer measures the absorbance of iodine at a wavelength of 510 nm. Students use both a linear regression (Initial Rates Method) and a non-linear regression to analyze the kinetics data to determine the orders of reaction and the activation energy. In addition to the experiments, students model the reaction using Aspen Plus using both batch (RBATCH) and continuous (RCSTR) reactor models. The fact that the experiment is portable allows the equipment to be wheeled into the classroom for demonstration during lectures. Students taking Chemical Kinetics C&PE 524 will learn how the experiment works, the methods for data analysis and be assigned a homework set based on actually experimental data being measured by the Senior class. This will connect the lab course with the kinetics course and familiarize the Juniors in C&PE 524 with the kinetics experiment they will do the following semester in the undergraduate laboratory course C&PE 616. In addition, future experiments can be conducted with other reactants such as bromine and the effect of different catalysts can be studied. A new thermodynamics experiment is planned for construction during the summer of 2017 and ready for use in C&PE 616 by the Fall semester. The intent is by the Fall of 2018, that three new experiments focused on kinetics (complete), thermodynamics and fluid mechanics will be ready which connect the theory taught in the core courses with the laboratory course. The experiments will be portable and allow instructors to describe the experiments in the classroom and build homework sets based on data measured by students to familiarize Juniors with the Senior laboratory equipment and analysis methods.